Apple Magic Mouse: A Touch of Magic? "It's no secret that Apple is doing really well at the high end of the personal computer business, but the other day I got some data that cast its recent achievements in a whole new light. In September, according to market researcher NPD Group, Macs accounted for 18.9% of all laptops and desktops sold in US retail outlets. For computers priced above $1,000, Apple's share was an astonishing 89%." 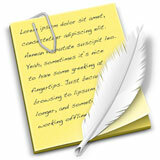 "Last month we blogged about a bug marring Flash playback on the latest 27-inch Apple iMacs. Users on several Web sites, including the Apple Discussion Threads, noticed a problem with the Flash player that caused choppy audio and video playback, but it appears that the newest Mac OS X v10.6.2 update fixes the issue that was apparently caused by a conflict with the AirPort driver." "Electronista has received one of the first Core i5 iMacs and is putting it through its paces. Since many already are already familiar with the 27-inch iMac in Core 2 Duo form, we'll provide impressions specific to the faster model. We also have some of the first benchmarks of the system, which is Apple's first quad-core system ever outside of its Mac Pro workstations." Editor's note: Electronista benchmarks the quad-core i5 iMac against the 2.4 GHz 24" iMac introduced in August 2007, not the recently discontinued 24" iMac, which came in speeds from 2.66 GHz to 3.06 GHz. There have been two CPU generations since then, and the i5 is based on Intel's much more powerful Nehalem architecture. This means it has Turbo Mode, which allows the 2.66 GHz CPU to run individual cores as high as 3.2 GHz, which helps explain Electronista's comment that "the Core i5 iMac already scaled higher than the 10 percent increase in clock speed would suggest". "The iMac Core i7 (quad-core) finally gives us an 'all in one' Mac that can 'run with the big dogs.' It is just a few steps behind the 2.93GHz quad-core Mac Pro and significantly faster than the fastest dual-core iMacs - at least when running 'MP aware' software. With memory expansion up to 16GB, drive options up to 2TB, Radeon HD 4850 graphics, and a 27" LED display, there is very little else you would want if you are a fan of "all in one."" "The Mac mini certainly doesn't have the 'wow' factor of the new 27-inch iMac, and it's not portable like the new MacBook. But it shouldn't be overlooked. It's a fine little system for users looking to get a new Mac without having to break the bank." "...results were mixed. The latest version of 'Snow Leopard' was only faster in one instance for each GPU. In most cases, the 3D apps ran faster under 'Leopard' 10.5.8 or the initial release of 'Snow Leopard' 10.6.0. We expect the 'Snow Leopard' drivers will continue to 'evolve' as time passes." Link: OS X 10.6.2 vs. 10.6.0 vs. 10.5.8: How Fast Do 3D Apps Run on Each? "In 2005, Apple released the first Mighty Mouse. A year later a Bluetooth version was released. As much as we appreciate Apple's attempt to creating a good looking mouse, the Mighty Mouse was heavily criticized for its usability - right click was awkward and the scrolling wheel was difficult to keep clean. How many times did we bang our heads because the wheel had stopped working? "The future of Apple's mouse family is all of a sudden looking brighter with the introduction of the new Magic Mouse. If you are inline with Apple's design philosophy, you would love the hardware design of the Magic Mouse - it's simple, and it's beautiful. The Mighty Mouse was a great piece of design with only a visible scrolling wheel on the top surface, the Magic Mouse takes one step further and presents you with one clean, curved top surface. From purely the appearance perspective, the Magic Mouse is absolutely breathtaking...."
Link: Apple Magic Mouse: A Touch of Magic? PR: Want to try life outside of Windows? You've come to the right place. Users are switching from PCs to Macs in droves, and now you can, too, with this helpful guide. This book is fully updated for the new generation of Mac hardware and software, including Mac OS X Snow Leopard, the iLife suite, and the latest trends and tools Explore running Windows on your Mac via Boot Camp, how to switch your applications, converting your business to a Mac, getting online, and more Plus, you don't even have to give up Microsoft Office, thanks to Microsoft Office for Mac-so get this indispensable book and join the fun! Author Arnold Reinhold has more than three decades of experience in the software industry. His first Apple product was a Mac 512. He has coauthored numerous books, including Green IT For Dummies. Other "For Dummies" books available through Low End Mac's Amazon.com store. 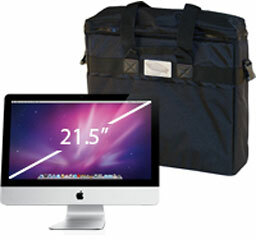 PR: iLugger has created a new carrying case in response to Apple's launch of the new 21.5" iMac. It is available for preorder now and will be shipping on December 1st. 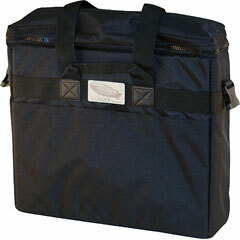 iLugger has launched this new bag in response to Apple's addition to their iMac line. They now offer a case designed specifically for the new 21.5" iMac the 27" iMac. These cases have become well known for their high-quality, nylon fabric casing that resists tears as well as water, plus the heavy foam padded interior that will protect your new LED screen from bumps during transport. However, even though Apple has discontinued all other sizes of iMacs, iLugger will continue making cases to fit all iMacs (old and new) so customers never need to worry about the quality of protection that they will receive from their iLugger. The 21.5" case will be available on December 1st and will sell for $129.99, while the 27" case will be available by the end of December and will sell for $199.99. Both sized cases will be available in black with more color options possible in the future. The new 21.5" case would make a great Christmas present to anyone with a new iMac on their list. Preorder for earliest delivery. PR: QuickNote is a combined stickies and clipboard manager, useful to quickly jot down ideas and to-dos, store quotes, code snippets or whatever. QuickNote is easily accessible from the menu bar, or with keyboard shortcuts: one to pop up a new sticky, one to edit the clipboard and one to save the clipboard without any further ado. A nice sound effect confirms the save. Simple, good looking and free of charge. Also, if you use ResEdit to put your username and password in the obvious STR resource, you won't have to enter it when you start the program. It would be nice if you didn't have to use ResEdit, but why not open ResEdit and reminisce anyway? What's New in Version 0.0.9? Not a lot, but it's less proof-of-concept and more user-friendly. You can hit [enter] instead of clicking "ok". That's nice. Also, if you use ResEdit to put your username and password in the obvious STR resource, you won't have to enter it when you start the program. It would be nice if you didn't have to use ResEdit, but why not open ResEdit and reminisce anyway? When you type your password, it's plaintext. Frankie says relax. Outlines around 'OK' buttons disappear if the window is repainted. Outlines around 'OK' buttons are fugly. Should have a 'Remember Password?' checkbox so you don't have to use ResEdit. PR: FileMaker, Inc. has announced the Bento 3 Holiday Pack, a free, fun, and easy way to get organized for the holidays that works with Bento 3, the popular personal database from FileMaker that is as easy to use as your Mac. Whether the task is planning holiday parties or organizing gift lists, the Bento 3 Holiday Pack makes it easy. The Bento 3 Holiday Pack includes a 30-day trial of Bento 3, plus two festive themes and two additional templates (beyond the 35 that come with Bento 3) to help plan parties and organize a gift list all in one place. The gift list tracking template tracks gifts both given and received, tracks thank-you notes and even provides a place to store comparison-shopping details. It's great for the holidays, but equally handy for other events like birthdays, anniversaries, weddings, and showers. The Holiday Party Planner stores a guest list which links directly to the Mac Address Book, a to-do list which links directly to iCal Tasks, recipe files, food and beverage list, the menu and more. The Bento 3 Holiday Pack also works with Bento for iPhone, so customers can work on holiday planning on an iPhone or iPod Touch, and then synchronize the information to their Mac. Bento enthusiasts downloaded last year's Bento 2 Holiday Pack by the thousands, said Ryan Rosenberg, vice president, marketing and services, FileMaker, Inc. With the Bento 3 Holiday Pack, we re providing even more new and intuitive ways for you to enjoy the holidays and more beautiful templates to help you get organized with style. The Holiday Pack is designed to work with the new Bento 3, the recipient of rave reviews from the media, including a PC Magazine Editors Choice award. Bento 3 now talks to iPhoto, making iPhoto albums viewable from within Bento. This makes it easy to store and edit detailed information about photos, and also to link photos to entries in a Bento database, whether it's for holiday photos or gift-giving plans. Users can also encrypt any field and assign passwords to information in Bento 3 to keep gift or donation information secure. Pixelmator is an easy-to-use, fast and powerful image editing program that has everything you need to enhance, edit and retouch your photos. Pixelmator's powerful toolset includes selection, painting, color correction and retouching tools that easily transform and enhance your photos and images. Layer-based image editing, filters and special effects help you quickly achieve impressive imagery. Apply over 130 special effects to your image, see results in real time. This user-friendly image editor has everything you need to achieve professional results. Add text to your pictures, analyze colors, crop, transform, rotate or move anything in your pictures. Made specifically for the Mac, Pixelmator takes advantage of built-in iPhoto support and one-click access to iSight. 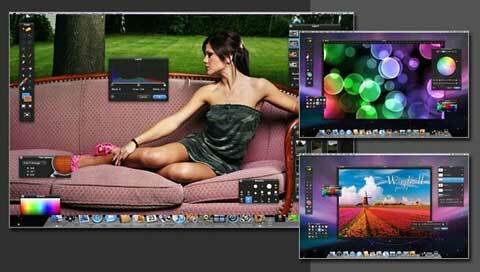 Pixelmator also takes advantage of OS X's built-in library of image filters and tools. This user-friendly image editor has everything you need to achieve professional results. With convenient In-App Help, you'll be able to quickly create the imagery quality you want. 1 GB of available disk space. Note: Pixelmator does not currently support CMYK. Pixelmator available as digital download or physical shrinkwrap disk for $39.99 + $12.55 Shipping & Handling for shrinkwrap product. You save over 30% off the regular price of $59.99.